The Oster Classic 76 Universal Motor Clipper is a professional quality clipper that comes with 2 blades, but you can purchase other size blade and combs to change the length of the hair you can cut. 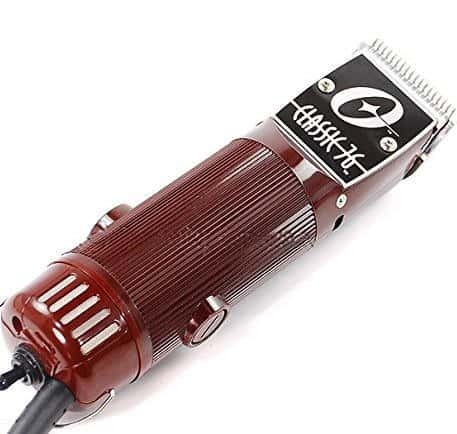 While some people use this clipper on their face, it’s main purpose is to be used for clipping hair. 8 to 9 foot power cord. Blade guard, oil, cleaning brush and clipper grease. This clipper comes with two blades, which allows you two length settings, both medium and short. You can purchase other combs and blades that will allow you to have a choice between more lengths. This clipper does not come with self sharpening blades. To maintain the blades you need to brush the blades after each use, and oil the blades prior to using in order to keep this clipper functioning properly without over heating. The Oster Classic 76 comes with an attached 8 to 9 foot cord. It is plenty long enough to move freely while cutting your hair. These clippers are not waterproof. You can purchase other blades for this Clipper. Professional Quality Clipper: This is a professional quality clipper. It is sturdy, well designed, and highly functional. This Clipper is Durable: This clipper comes with a break resistant housing and with proper care should last the normal users for years. Quiet: Users really find these clippers to be extremely quiet even when clipping hair near the ears. Cuts Clean: Users find that these clippers cut extremely clean. Most users find they only need one pass with the clippers even when cutting their own hair. When your purchase this clipper you get the clipper with cord, two blades 000 and 1, Blade guard, lube oil, blade cleaning brush, and clipper grease. This clipper measures 2” X 2” X 7.5.” It does not come with any special means of storage, however, you can store it in a draw or purchase a storage bag or case for these clippers. This Clipper is quite expensive and purchasing extra blades only adds to the cost of the clipper. However, since with proper care this clipper should last for years to come. It comes with a 1 year limited warranty. The Oster Classic 76 is a high quality clipper that does a great job of cutting hair. While this clipper is somewhat on the expensive side, it proves to be an excellent value since it may be the last hair clipper you will ever need.